Sooner or later I get asked the question: “Derrick, what’s your favorite horror movie?” and the answer I give is one that never fails to get the same reaction. The questioner’s eyes open wide and the corners of their mouths turn down a bit. “Really?” they’ll say. “Isn’t that movie kinda…well…corny?” Well, maybe so but then I recall the old saying about one man’s trash being another man’s treasure. And HOUSE ON HAUNTED HILL is a treasure of mine. Maybe it’s because I have fond memories of watching the movie along with my parents and my sisters every time it was shown on Channel 9 here in New York during the 70’s. 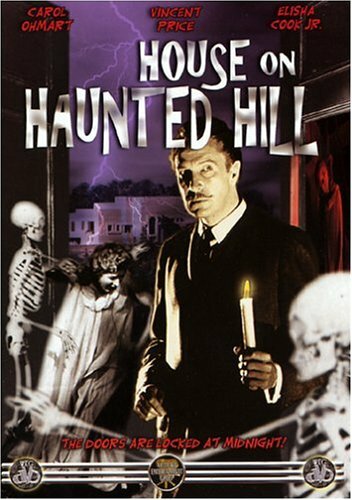 When I first started to try to write stories when I was around ten I must have rewritten HOUSE ON HAUNTED HILL a hundred times. Maybe it’s because the story ends on a plot twist that to an impressionable young writer such as I was at the time was nothing short of brilliance. As an adult I’ve long ago stopped trying to analyze why I like something. It’s just enough that I watch it and it’s a ritual that every Halloween I watch HOUSE ON HAUNTED HILL. 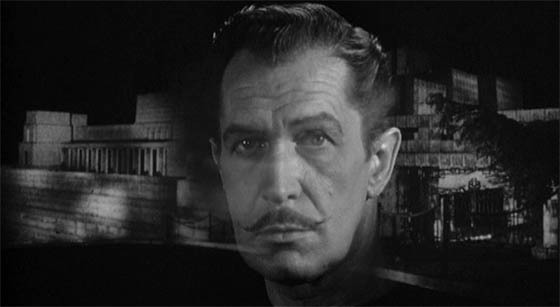 Eccentric millionaire Frederick Loren (Vincent Price) has invited five people to stay the night in a genuine haunted house. It’s haunted because seven people were murdered there some years ago and supposedly their ghosts still walk the halls, wreaking vengeance on any foolish enough to stay the night. Loren is willing to risk staying the night along with his wife Annabelle (Carol Ohmart) and he’ll give the other five $10,000 apiece if they will also stay. It’s an equally eccentric bunch Loren has invited. Lance Schroeder (Richard Long) is a test pilot who wants to test his nerve. Nora Manning (Carolyn Craig) is a secretary supporting her family and she honestly needs the money more than the others. Watson Pritchard’s (Elisha Cook) family used to own the house and Watson himself is the only human being to have ever survived a night in the house. It’s doubtful that his sanity has survived. Dr. David Trent (Alan Marshal) is a psychiatrist who wants to test his theories on hysteria and shock. Ruth Bridges (Julie Mitchum) is a nationally syndicated columnist who needs the money to cover her gambling debts and keep herself out of the gossip columns. Everybody is locked inside at midnight and can’t leave until 8AM the next morning. Loren passes out .45 automatics as ‘party favors’ and that’s when things start happening. Blood drips from the ceiling. There’s a severed head that keeps disappearing and re-appearing in the most inappropriate places. There are secret passages, a vat of acid in the basement. Ghostly women float in mid-air outside the barred windows while horrendous lightning storms shake the house. The ghosts appear to be focusing their attention on Nora who despite her steady, dependable exterior is swiftly driven to near madness. But is it really something supernatural at work here or does the source of the house’s evil have a human cause? 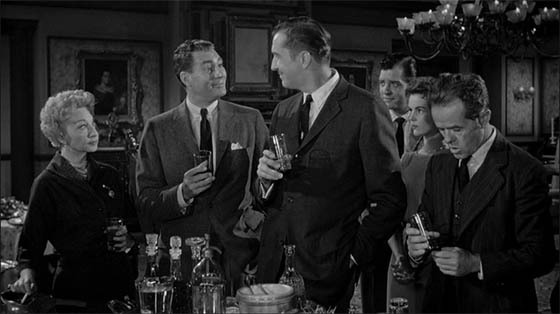 HOUSE ON HAUNTED HILL is great fun to watch if you approach it in the right spirit. Sure it was filmed on the cheap and the special effects aren’t exactly special. But there’s that wonderful Vincent Price performance and both Carolyn Craig and Carol Ohmart are no Fay Wray but they’re terrific screamers in their own right. And at 75 minutes the movie doesn’t waste your time. It’s all plot with just enough characterization so that we know who’s doing what and why. And HOUSE ON HAUNTED HILL has one of the most blood-freezing scenes I’ve ever seen in a movie. Nora Manning is trying to find a secret door in a room down in the wine cellar. She bends down briefly, stands up, turns and is face to face with a hideous old woman, claw like hands outstretched, her jagged teeth bared. Nora screams and jumps back and the old woman doesn’t run out of the room. She floats. It doesn’t sound very blood-freezing when you read it but I guarantee that if anybody you know has seen HOUSE ON HAUNTED HILL they remember that scene if they don’t remember any other. So should you see HOUSE ON HAUNTED HILL? I certainly recommend it. And there’s a double sided DVD available that has not only this version but also the 1999 remake as well which I also recommend. I don’t like it as much as the original which will always have a special place in my diseased heart but it’s worth seeing. My fave from that time, I think, was THE NIGHT WALKER, complete with ad intro from Robert Bloch. He asked us not to see the movie if our nightmares were too intense.